When I got back from the road trip, I was saddened to learn that Crescent City legend Barbara George had lost her battle with Hepatitis, and died of a lung infection on August 10th. George, pictured here performing at Emperor Ernie K. Doe's wake in 2001, was best known for her monster 1962 hit, I Know. That song, as well as an excellent write-up about Barbara's life and times, was featured at the mighty Home Of The Groove by my pal Dan Phillips on August 17th. I'd like to take this opportunity to feature the other side of the record. 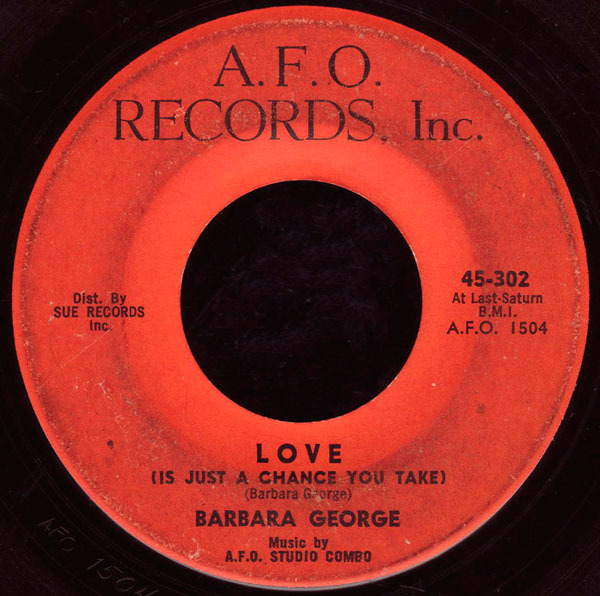 The first thing I want to point out is that Barbara WROTE both this steamy, buttery slice of R&B, and the chartbustin' A side (something I never realized)! The "A.F.O. Studio Combo" (who had just finished recording Check Mr. Popeye with Eddie Bo) are red hot, and just about the coolest guys on the planet at this point. 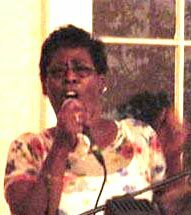 Check out Ms. George beltin' it out, and the incredible guitar work of Roy Montrell... yeah, you rite! I won't go into all the details of A.F.O. 's ill fated distribution deal with Juggy Murray's Sue Records here (Dan can better school ya on that one), but when the combo backed up Lee Dorsey on Ya-Ya for New York competitor Bobby Robinson, Murray used that as an excuse to sever his ties with A.F.O., and steal Barbara away from them. As Dan points out, there is an excellent article in the Houma, LA Courier by Naomi King that details Barbara's triumph over all that negative music industry stuff, and her return to her first love, Gospel Music. In the article, her cousin Linda Eubanks talks of traveling with Barbara in the early days of her career, and about how all the photographs, records and awards she had kept for over forty years in her Uptown New Orleans home were destroyed by the mold and mildew left behind by Katrina's devastating flood. "All that I have is memories", she said. It's up to all of us to keep those memories alive.